What makes him sleep through the night? I haven’t been able to figure out why I’m struggling to find enough hours in the day to get everything done. Then I wrote that post about Quinten not sleeping very well. It was like my own words slapped me in the face. I’m exhausted! Somehow it’s kind of hidden. Yes, I literally yawn all day long. Lots of nights I feel like I will barely make it to bedtime (yet stay up until 10:30) and most mornings I have a hard time getting out of bed. Yet, I still didn’t realize how tired I am. Last night I went to bed at 9:30 and Quinten didn’t wake up until 6 am. It was glorious! I didn’t yawn during conversations. I didn’t hit snooze until 6:30 (well, I couldn’t since I was nursing a baby). I felt … awake. 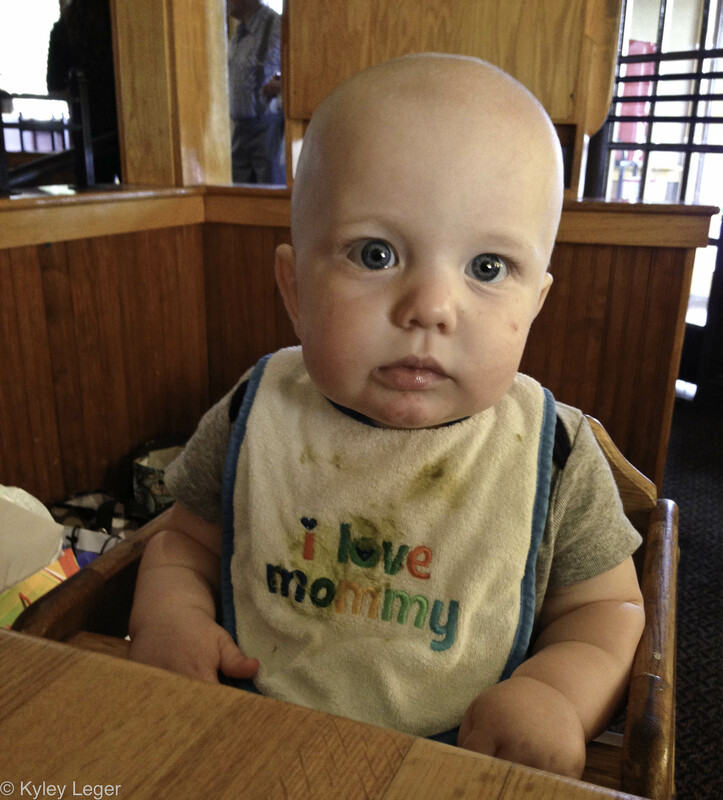 First time in a restaurant high chair. Not impressed. I’ve been thinking about what makes him sleep and not sleep. Our evening routine is basically the same every night. He eats about the same amount of food and has about the same amount of milk. Last night was a little different. He had a lot of milk. A LOT! Yah, so apparently the key to getting him to sleep through the night involves about 15 or 16 oz of milk in the evenings! Or, traveling. Because he proved me wrong when we were gone this weekend and he slept through the night in a strange place. I’m afraid this evening didn’t consist of that much milk, so we’ll see if he wakes up before 6 am. It’s 10 pm and I’m still awake. (He just woke up screaming so I had to rock him back to sleep. I imagine the burp he let out had something to do with the wake up.) If I’m tired tomorrow it won’t be much different from any other day the past 8 months. I just need to decide if I’m going to change my life around so I can spend less time feeling this tired. I struggle with doing much because it’s so hard to go to bed at 9:30 when there are so many other things to do. Instead of going to sleep, I could hang out with my husband, clean my house, write, read, or do laundry. You’re tired too, right? RIGHT? This entry was posted in Baby, Quinten and tagged sleeping through the night by Kyley Leger. Bookmark the permalink. Sienna is also a big night eater. She will nurse at 5 and 7 and sometimes even a third time at 6. She then gets a bottle of bm at around 8 (5-6 ounces). So we are guessing she eats anywhere between 10-15 ounces in a 3 hour period of time. It seems to work though! Yes, the goal is definitely to fill them up! That is a big part of the reason Dan feeds S a bottle at her last feeding. She focuses on the goal better and eats 5-6 ounces really quickly instead of getting all snuggly and warm from nursing.